Between last night and this morning an “I’m in for Britain” poster popped up in the window of my upper-middle-class neighbours. This display of support for Remain is rather gutsy for Kenilworth, Warwickshire, where Leave posters are in many windows and I’ve had Leave propaganda raining through my mailbox for weeks. It seems like Remain assumed that common sense would prevail and that they could sit back and have a cuppa, while Leave are pouring everything they’ve got into convincing the 10% of undecided voters. Maybe my neighbours have realised that a Leave victory is a real possibility. 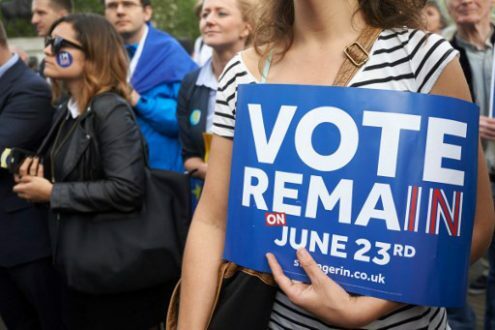 On Thursday Britain will vote on whether or not to leave the EU, a vote that will have major consequences for Britain, Europe, and the rest of the world too. Campaigning on both sides has been hysterical and sensationalist, flinging around “the facts” on immigration, jobs, and the amount of money lost and gained from membership. These facts are continuously debunked and challenged, further undermining the authority of politicians and experts who are already mistrusted by many people. This leaves people to make up their minds on the basis of moral arguments, which in this case are complicated, or by “gut feel” based on their own experiences and memories, and affect, which both sides are trying to manipulate. The referendum raises questions about democracy: should “ordinary people” without training in economics, history, and multilateral institutions be taking a decision as big as this, which will have consequences for generations? David Mitchell, following Richard Dawkins, has argued that this should be left up to elected leaders with the education and expertise to decide. This implies a particular model of democracy in which ordinary people do not make decisions directly, and their power is handed to a small group of people who are trusted to know what they are doing. The role of the media is precisely to bind together this paradox of representative democracy: the media should monitor what those in charge are up to and keep them accountable to the public, and it should inform that public so that it can better participate in the affairs of the state. The UK media has done an OK job of the first part: they report every claim and counter-claim of all the major Brexit roleplayers, and the debates are all over the radio and presumably the TV (I don’t have a TV so I can’t say for sure). Competing claims have become wilder and wilder, to the point that the chairman of the treasury committee in parliament, after hearing evidence from Leave, said that “Both sides in the referendum campaign have traded in outrageous claims and unsubstantiated assertions, masquerading as facts”. The news media report these battles in an exhaustingly amplified cycle of he-said-she-said. Anyone who wants to know what David Cameron or Nigel Farage or Jeremy Corbyn has to say about Brexit at any given moment can easily do so. These news stories are cobbled together responses to responses to original statements that have been blown so out of proportion that the actual issue is obscured from sight. Less prevalent is reporting which equips people to appropriate the facts and claims, interpret them, distinguish between the different kinds of arguments being hurled at them, and make some sense of it all. The UK is information rich – access to the internet and to news and information is not a question in the same way it is in South Africa or other developing country contexts. But whether or not that information becomes knowledge that citizens can use – what happens in the process of packaging and massaging it – is less clear. And in a moment like this where a decision with intergenerational implications and global ripple effects is being taken in a referendum, the role of the media in helping people to decide well is crucial. This is a rare and historic moment of direct democracy, where people will make up their minds with more information available to them than ever before. Held up like a prism on a pendulum, Brexit illustrates the many-faceted interactions between political systems, people, and the media. Brexit offers an opportunity to question how the facets touch sides and what is at stake in the way they connect, both in the UK and at home. Abigail McDougall is currently studying a masters in creative and media enterprise at the University of Warwick in England. She is a 2013 Mandela Rhodes Scholar. Her background is in journalism, politics, sustainable development and she is interested in all things media.